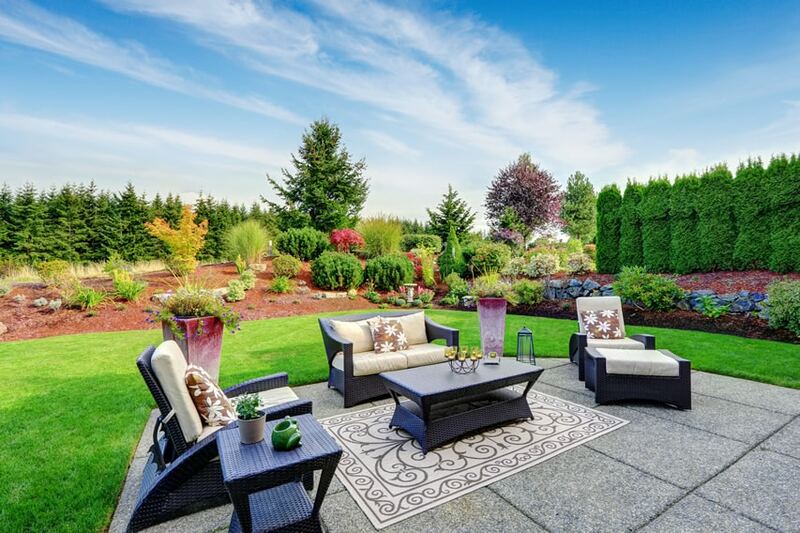 Some of the popular types of patios include garden, pool, concrete, stone, brick, and dining. 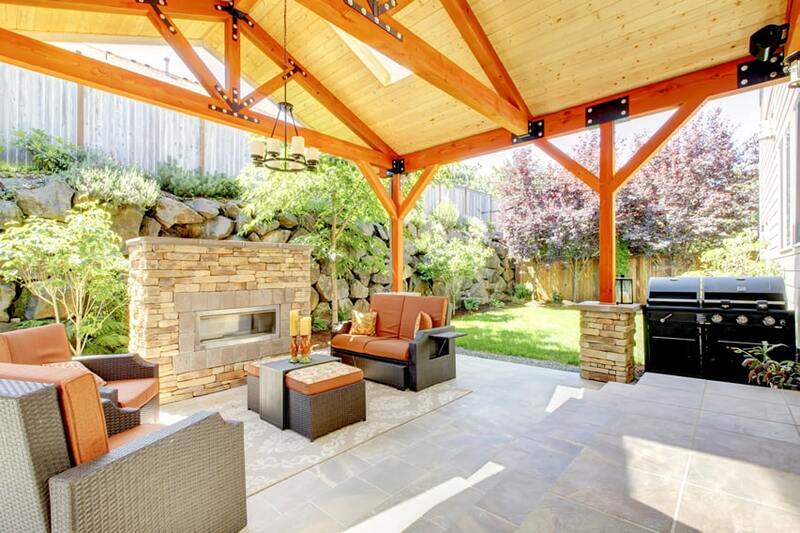 They often have features such as a barbecue, outdoor kitchen, water features, pathways, fire pit, fireplace, gazebo, pergola, canopy, and furniture that can handle different weather conditions. When creating a custom patio design there are endless opportunities based on the areas shape, size, materials wanted, and building budget. 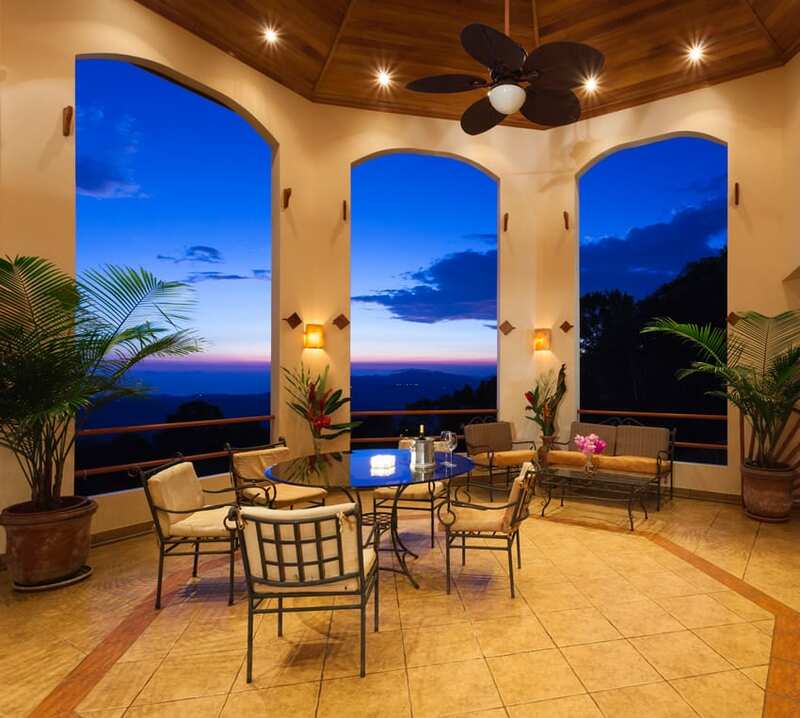 In the picture above a beautiful octagonal patio with a magnificent view uses country-inspired aesthetics. Floors are non-slip ceramic tiles in light orange, with accent border ceramic tiles in terracotta red. The ceiling uses natural maple wood planks in place of paint. Potted palm trees are positioned around the walls to bring in the tropical feel to the space. Flagstone – both of its characteristics and color is created from natural process wherein it forms a slow and gradual accumulation of layers of mineral, clay, sand, and organic sediments. The most popular colors which are available include blue, red, and buff. The appearance of this kind of materials is indeed earthy and timeless. Its size and shape are irregular and these are hard to work with. A flagstone patio comes in various types, namely bluestone, which has more durability requiring a sealer for color maintenance. Another popular choice is sandstone, which is porous and prone to water damage. It is important that designs using flagstone have adequate drainage because of its tendency toward splitting and erosion. Patio Pavers – it has a variety of forms including concrete, stone, clay, and recycled plastics. For a patio to last longer with less color fading, it is recommended to make use of concrete or stone pavers. Stone patios are practically maintenance free making them a solid choice for backyard designs. In order to maintain the patio shape, be certain to ring the paver installation using a border of lumber that is pressure-treated. Clay Brick – it provides an aesthetic complementing both contemporary and traditional architecture. Usually, bricks are able to maintain its warm and rich color because of its handy weight as well as size. Brick patios can be installed as a DIY project without much if any experience. Bricks are versatile in patterns of round or rectangular and can be used for a wide variety of layouts. Gravel – it can be installed fast and easy and it comes in two types which are crushed stone and river rock. Gravel deters the growth of weed and provides excellent drainage when it is installed on fabric landscape liner. Gravel can be used in gardens or courtyards but is also needs a high-maintenance as it is plagued by stones that makes it hard to keep it in place and at its level. Gravel patios are also inexpensive to create and make a good DIY project for someone without any construction experience. 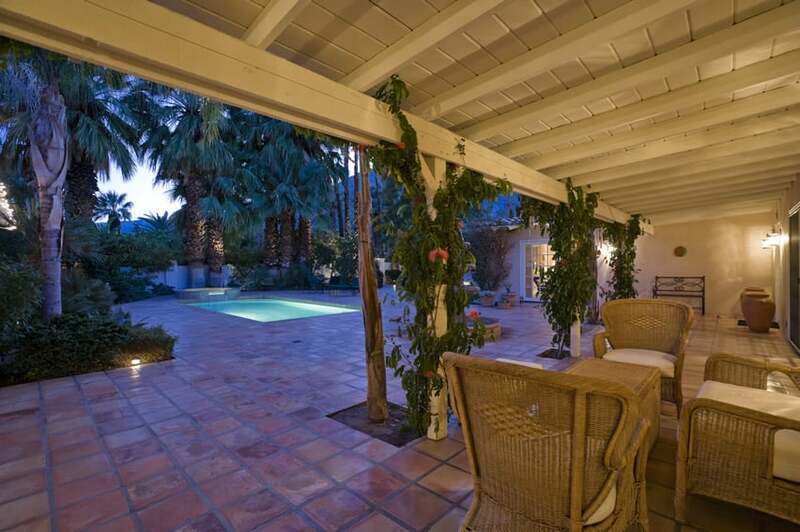 For this outdoor open patio, 30×30 terracotta pavement tiles were used for the flooring, with concrete “grouting”. The outdoor stairs have weather-treated cherry wood planks for its steps and the border of the plant boxes. Beautiful Bougainvillea flowers make a pretty backdrop behind the sitting area. This covered zen-like patio area uses weather-proof wood decking material in light gray, with gravel & pebbles for the outer garden area. The walls are also painted with a light gray color. A very minimalist style is used to provide an atmosphere of relaxation and comfort. 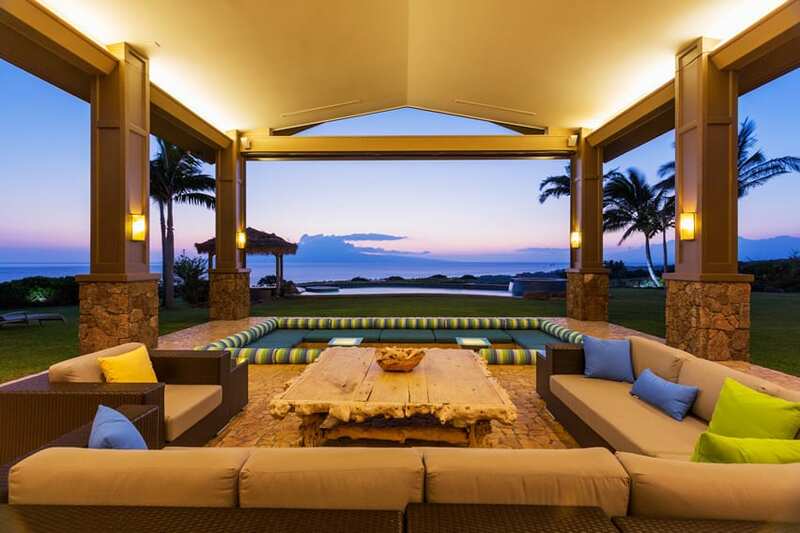 The ocean is the perfect canvas for patio design ideas. This oceanfront patio / balcony area uses reclaimed wood planks for its floors, then continuing this horizontal element to its walls with horizontal clapboards painted in a light cream color and the eaves with shiplap boards painted in the same color. This garden patio keeps a classic old-country feel with its dark red natural stone-pavers in various rectangular cuts. This is complemented by the blue-painted clapboards of the house and its white moldings and trimmings. 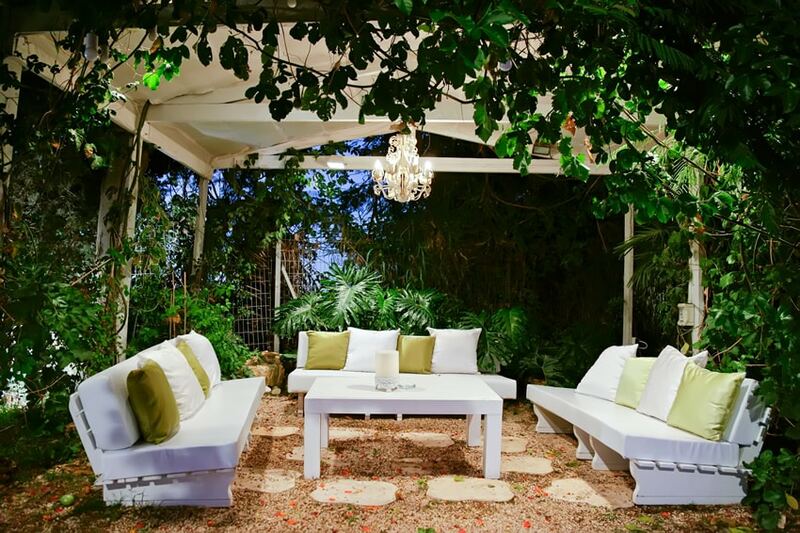 This beautiful patio paved with large natural stone pavers give a more romantic look with its white-painted trellis with creeping vines to provide as shade. The furniture pieces uses treated aluminum with a synthetic material for its loosely-woven seats. 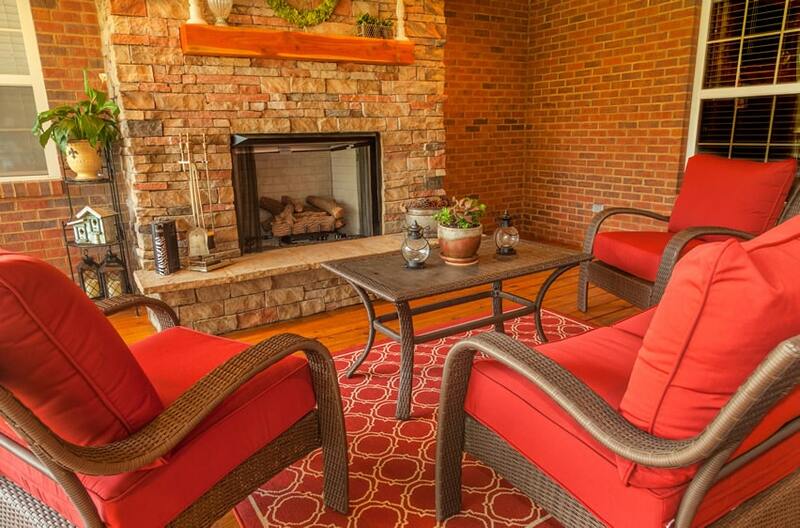 This beautiful covered patio uses red brick pavers for its floors to give that classic rustic look. To complements its floors, the exterior of the house is clad with natural-cut masonry stones with exposed wooden columns and beams in its natural color and finish. The ceiling also uses planks of weather-treated wood instead of painting it. The grand stone fireplace makes a fine nighttime attraction. A spacious modern patio area which only uses polished poured concrete for its floors and faux masonry tiles for its outdoor fireplace. The walls and ceiling are painted in light beige and dark beige. This covered patio area uses faux masonry tiles for its floors with anti-slip properties, combined with stone-clad concrete foundation with concrete beams and columns, fashioned to look like wood and painted in dark mocha. 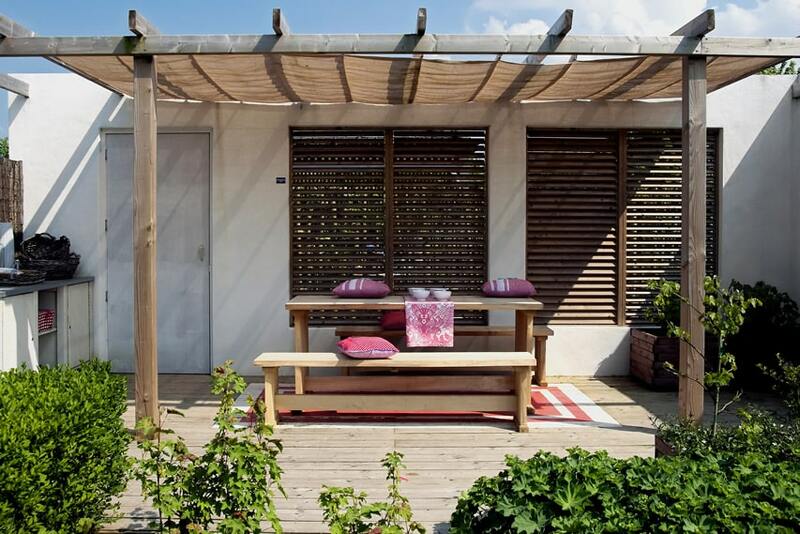 The furniture uses synthetic rattan and outdoor-appropriate fabrics. For this open patio, dark gray poured terrazzo was used as its flooring material. 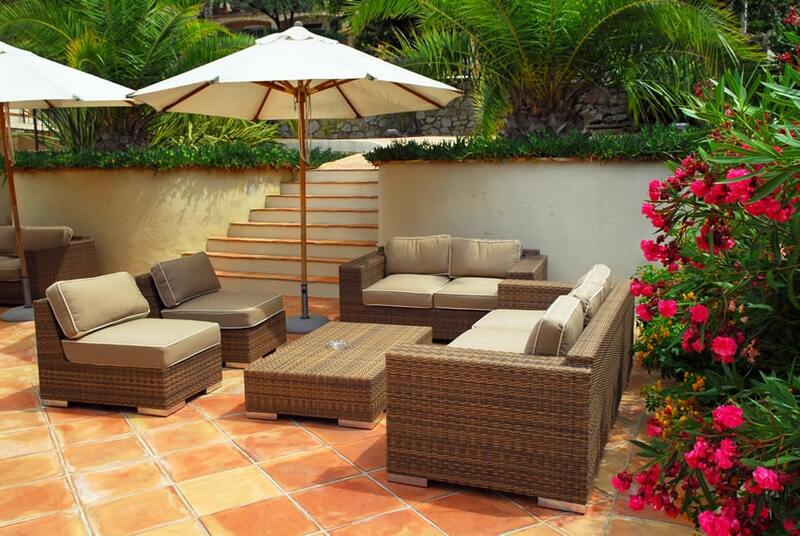 This is complemented by modern patio furniture which uses synthetic rattan and water-proof fabric and upholstery. An outdoor lounging area uses natural-cut stone floors in combination with masonry stone cladding used on its exposed columns and outdoor bar counter area. The Jacuzzi area uses mosaic tiles in a dark gray color. 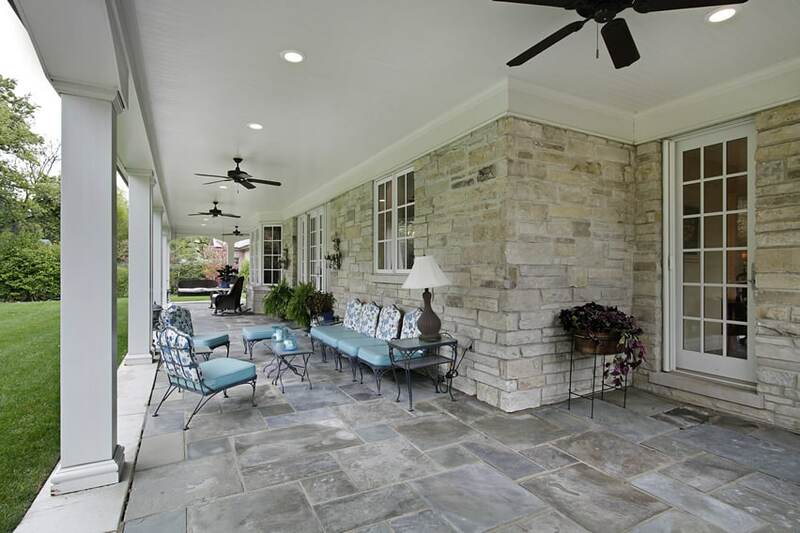 This beautiful open garden patio has a gorgeous fountain center, with large natural-cut limestone for its floors and cream colored natural-cut stone masonry for the exterior of the building. Windows and doors uses dark wengue wood which stands out on the cream-colored masonry stone walls. A very modern open patio design which makes use of large cuts of natural stone tiles with anti-slip treatment. 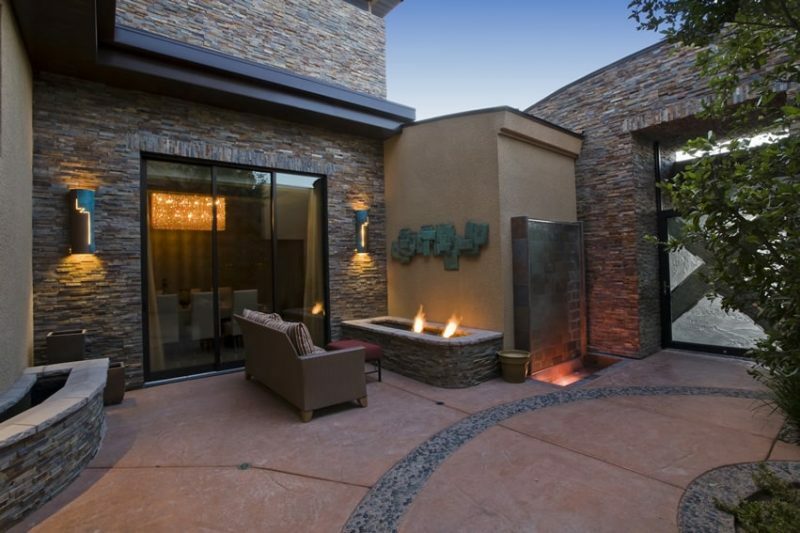 The built-in bench and firepit are also covered in the same type of material, while the walls for the building’s exterior uses 30×30 pieces of Tuscan Quartz. 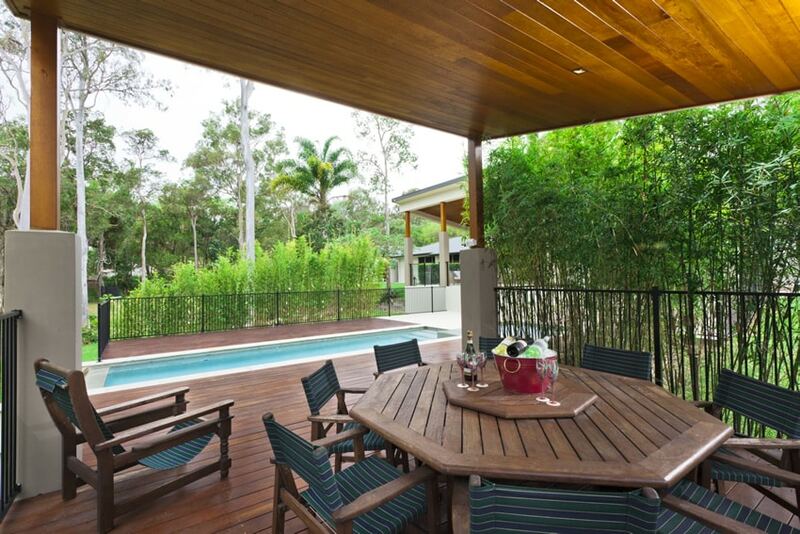 A nice covered patio by the pool, with elevated flooring covered in PVC decking material made to look like real wood. The ceiling for the patio roof is clad with Teak wood planks, while the pool-side uses gray Terrazzo with Natural Stone border tiles surrounding the swimming pool. This patio area features an outdoor dining area overlooking a sparkling lagoon pool with waterfall from the hot tub area. 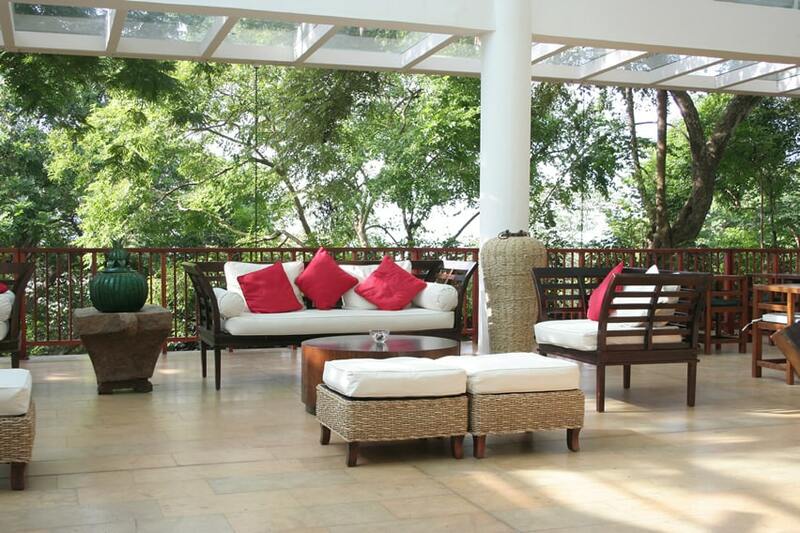 The patio boosts an impressive view of the surrounding mountains and lush tropical setting. 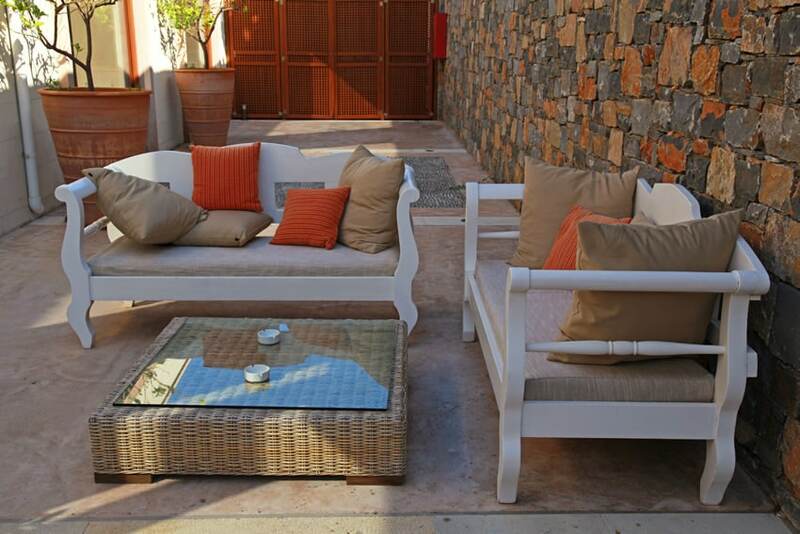 A variety of outdoor furniture provide ample seating and the opportunity to host visiting guests. 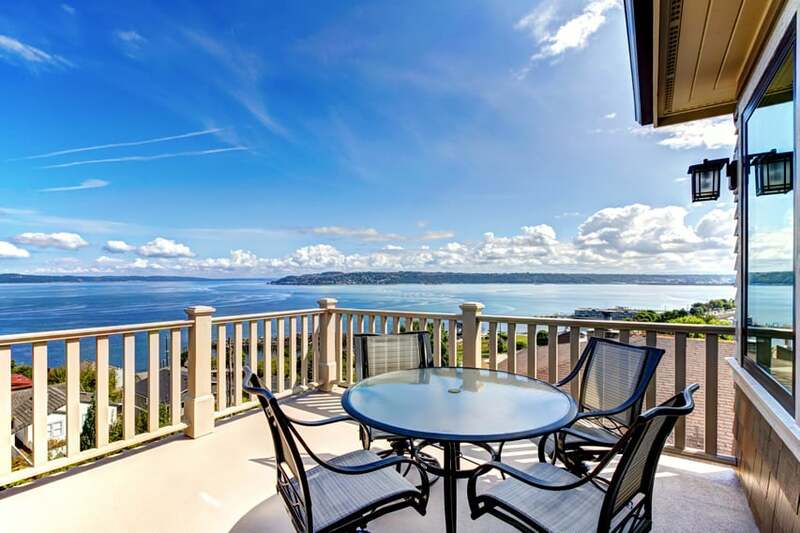 A wonderful view of nature can be seen from this balcony patio. The floors uses PVC decking in Cherry Wood finish, while the railings uses clear tempered glass to provide its users a view free from obstruction. 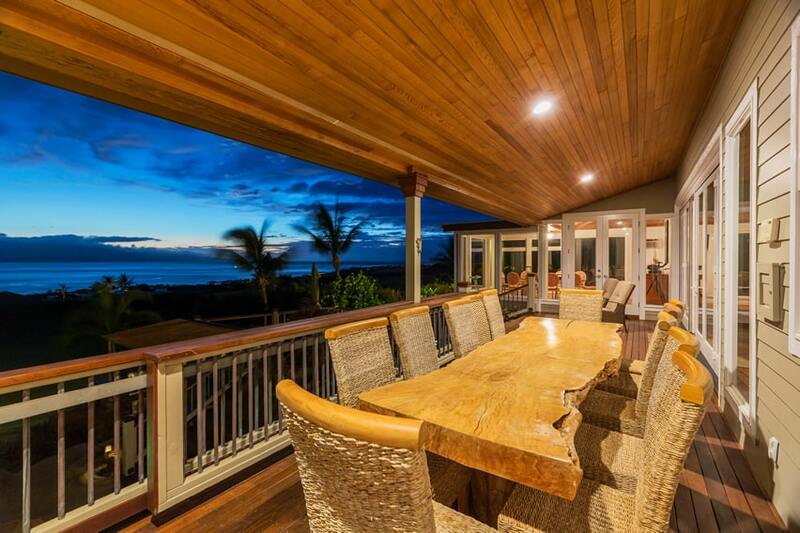 This simple country-inspired balcony has an amazing view of the ocean. The floors are simple – made out of rough, poured concrete and painted over with dark gray non-slip epoxy paint. Furniture pieces uses weather-resistant aluminum with water-resistant fabrics for the seats / upholstery. 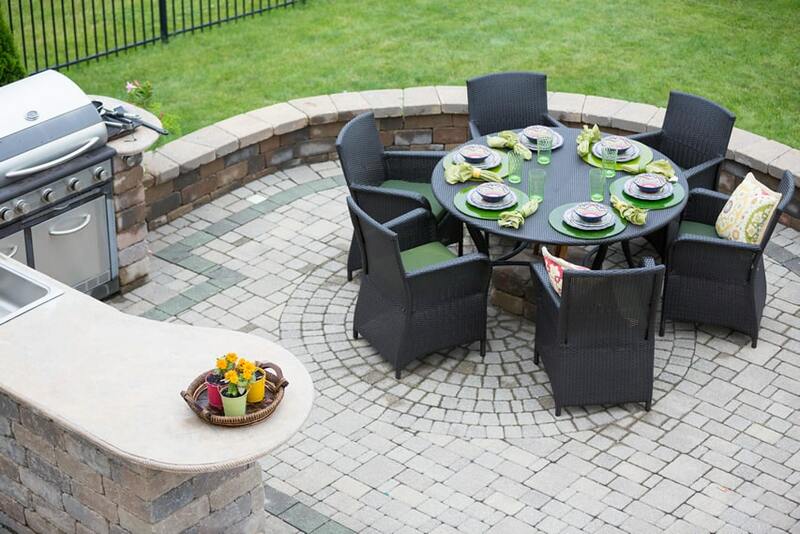 A simple fire pit with a tile table-top, a upholstered chairs in a circular pattern is an attractive place to relax and socialize while enjoying the view. A backyard patio which uses blocks of natural stone in various tones for its flooring, with weather-resistant redwood trellis. The outdoor fireplace is also made of stone masonry with various sizes of stones. All furniture pieces are weather-resistant, made from synthetic rattan and metal framing, topped with water-resistant upholstery fabric. This large open barbecue area uses gray stone pavers in a running bond pattern. The kiln area uses red brick tiles for its cladding with wooden trusses and clapboard-clad wooden eaves. This outdoor kitchen and barbecue area has a circular brick paver layout in the center, combined with pavers in multiple sizes for the rest of the floor covering. Its bar area is clad with natural stone masonry and topped with granite countertop material. 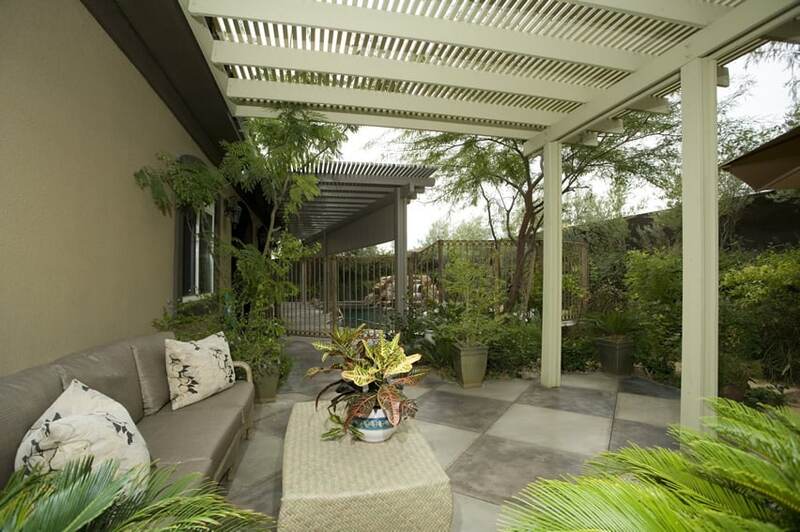 This modern covered patio area uses white non-slip ceramic tile flooring. 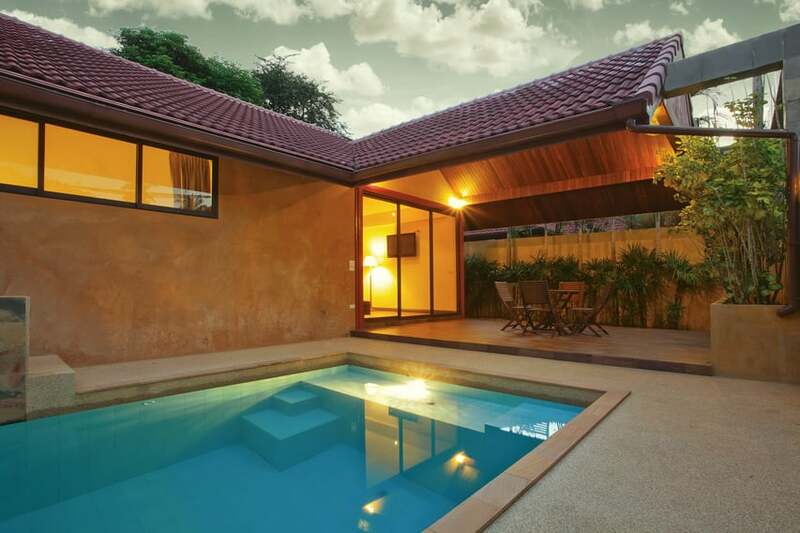 Walls of the house’s exterior is painted in mocha brown, with a drop ceiling clad with wood planks in wengue wood finish, varnished to attain a glossy finish. 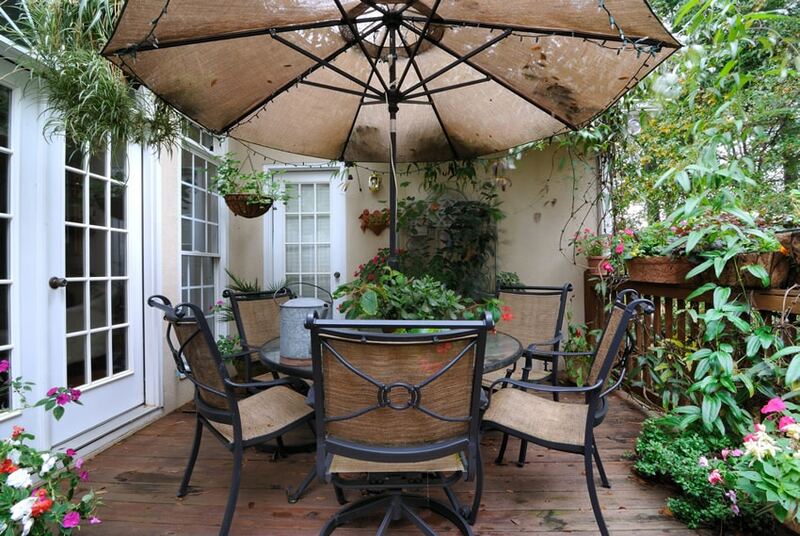 A quaint garden patio area with weathered wood floor planks and weather-proof wooden railings. It uses treated aluminum cafe seats and table with a built-in umbrella shade. The exterior of the house is painted in a light beige color, with white-painted doors and windows. This lovely patio of a forest cabin surrounds itself with greenery and nature. The floors are of white-washed weathered wood, with a built-in white-painted solid wood bench. The walls of the cabin is made of vertical planks of solid wood with a light gray paint finish. The kitchen / preparation area uses ceramic tiles for its countertop and Teak wood cabinet doors. This modern patio maintains a simple and straightforward color palette. it only uses one tone of wood for all its wood finishes, combined with plain white walls of the the house’s exterior. The floors of the patio area is weather-proof wood decking, while the columns, trusses and ceiling of the eaves also uses weather-treated teak wood in a similar tone. This simple patio uses mahogany wood deck floors with a PVC privacy screen with a pierced design and metal framing. The building’s exterior is finished with red bricks in a running bond pattern. Attractive outdoor couches and chairs make of as synthetic resin wicker are both weather resistant and stylish. 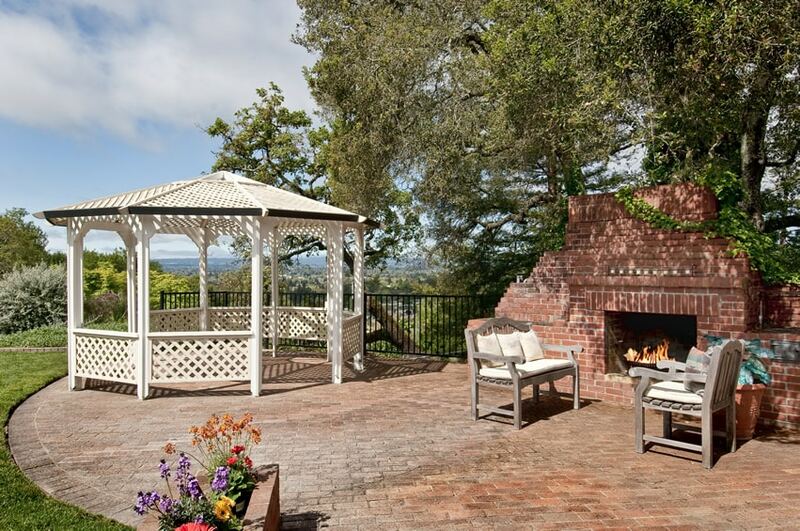 An open patio area with quaint fireplace clad with masonry tiles. The house’s exterior and entry arch also uses the same design of masonry tiles for its cladding. The floors are of colored concrete in a terracotta color with an accent of poured concrete with river rocks. Natural stone thin veneers in a light beige color covers the exterior walls of this house, with large natural stone tiles in a blue-gray shade. The ceiling of the patio uses wood planks painted in a semi-gloss white color, complemented by moldings in off-white. Several decorative fans help to keep the area cool. Wrought iron furniture with blue and white floral patters give this space a traditional appearance. 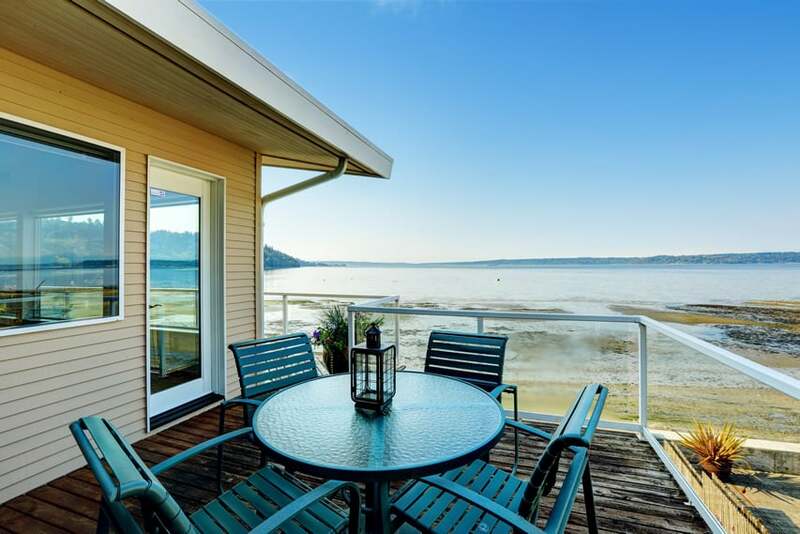 A balcony patio with a wonderful ocean view, it uses solid weather-treated wood decking material for its floors, and continues this horizontal pattern up to the ceiling which has planks for engineered wood in Cherry wood finish. The handrails also uses Cherry wood, and even the massive dining table is made of natural-cut wood. A custom crafted table made from an old tree log make an impressive centerpiece. 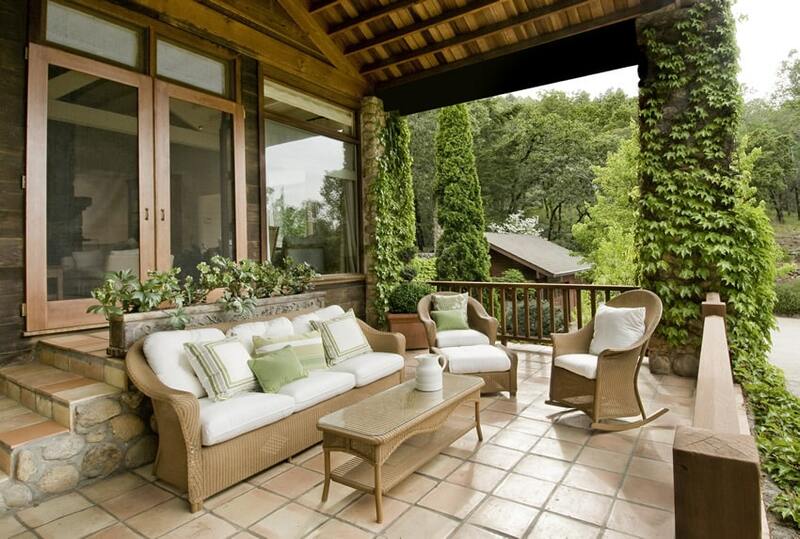 This cozy patio area has solid red Oak floors which are treated to resist water and termites. Its walls are painted in plain white, with wooden Doors and moldings in a Brazilian Walnut color. Furniture pieces are made of natural woven rattan with weather-proof fabrics. 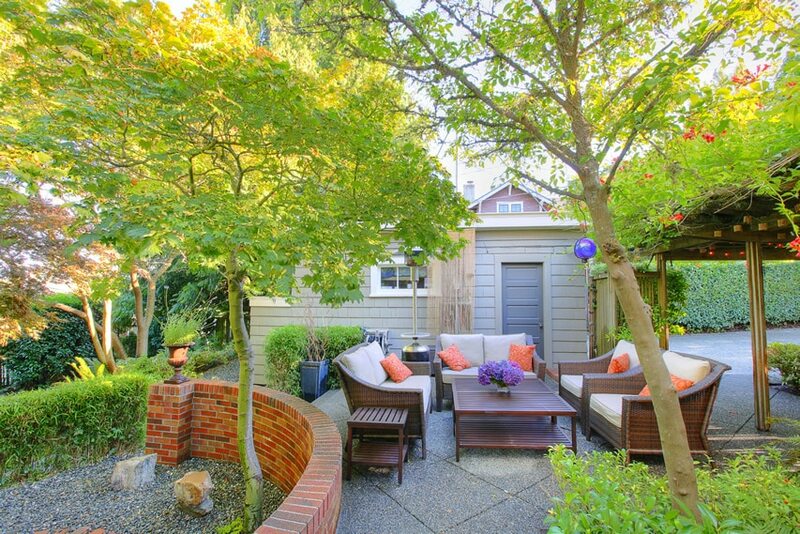 This large garden patio combines a variety of finishes and materials. The stairs leading to the elevated patio is finished with light gray terrazzo, while the sides of the elevated area is clad with natural stone masonry. The patio area itself uses weathered solid wood planks with complementary clapboard sidings. Plenty of beautiful flowers brighten the patio area and provide a lot of color. A semi-circular outdoor patio area with terracotta pavers and fireplace/kiln. 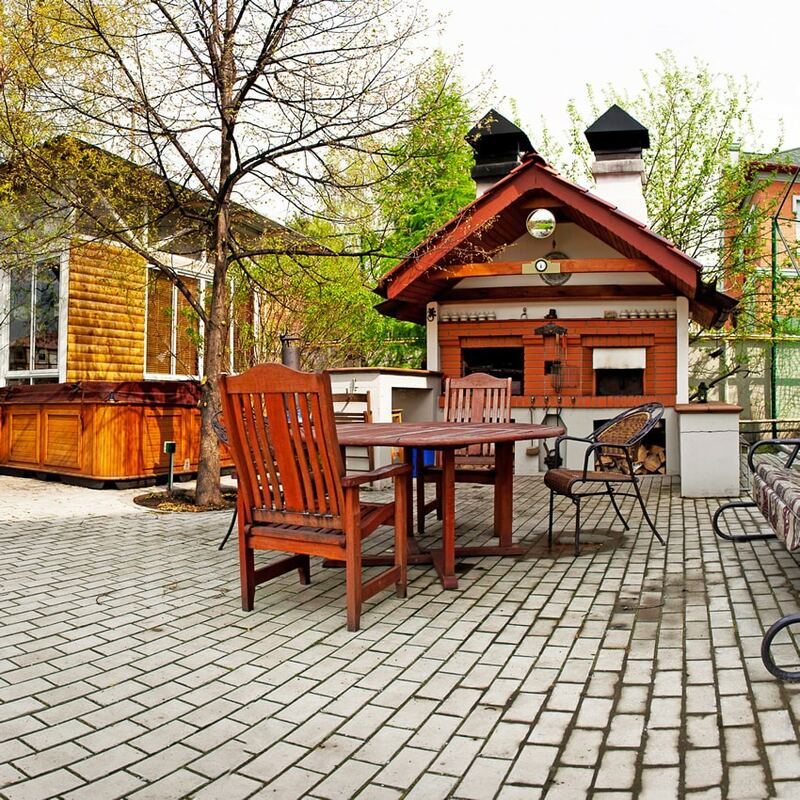 It also features an interesting wooden gazebo painted in white and uses solid wood furniture painted in a light beige color with cream upholstery. For this covered patio area, the flooring material used are light orange ceramic tiles with large grouting. The steps and landing leading to the entrance door uses terracotta colored natural stone tiles, while its sides are covered with natural stone pieces put together by concrete. The walls are covered with tongue and groove solid planks of smoked walnut. A carved wooden planter box sits above the outdoor couch made of resin wicker with matching resin rocking chair, table, seat and ottoman. In this open balcony / patio area used large gray stone tiles for its floor, combined with smaller sized ceramic tiles in a wood tone finish and color. The walls are painted in a bold red color, and the railings are clear tempered glass, maximizing the view. Beautiful light cream travertine floors line this patio with solid-surface bar counter in black with white specks. Its cabinets/drawers are clad with wood cut to size and layout of brick tiles. 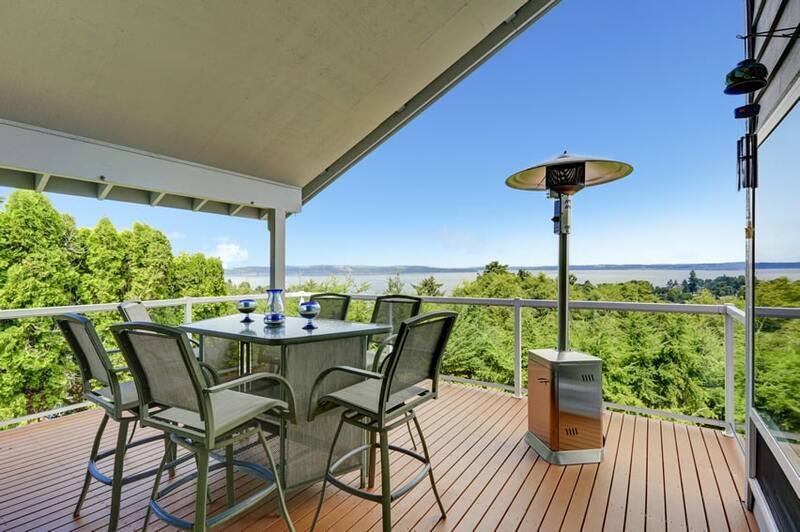 It also features a gorgeous gazebo in solid weather-treated teak wood with a stunning ocean view. 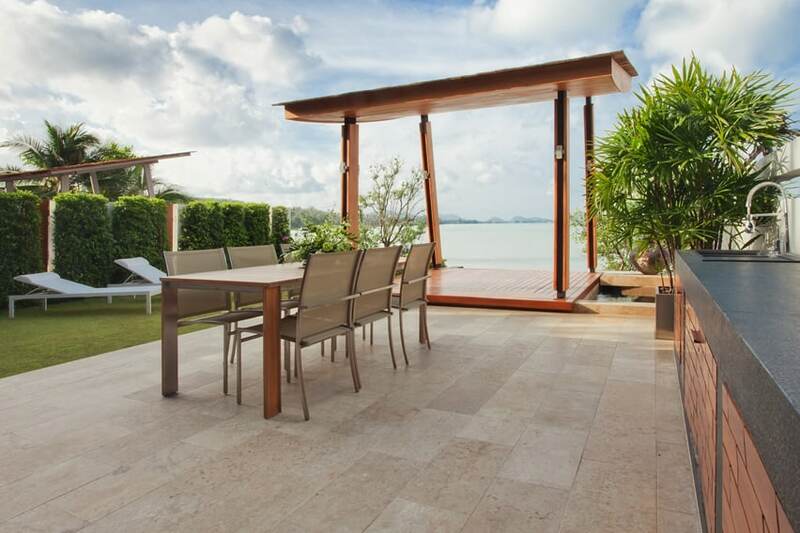 An elegant outdoor dining table and chair set are positioned in the center of the space. An outdoor kitchen sits to the side and features a sink and food prep area. A very cozy covered patio area with polished concrete floors and heavy stone masonry cladding for the lower half of the exterior walls. The rest of the walls are painted in a beige color with white-painted door and window framing and moldings. 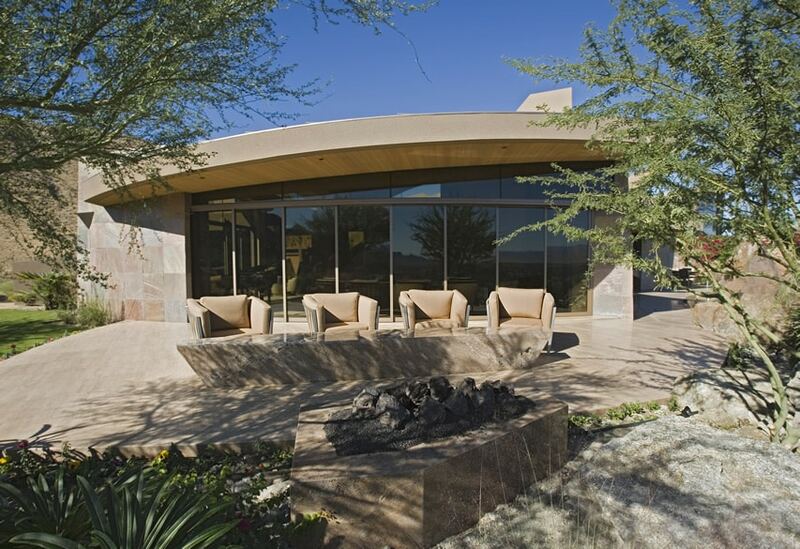 Metal outdoor chairs with overstuffed cushions and matching tables are positioned around the rock fireplace, and rest on a patterned rug. This modern pool patio design uses weather wood planks for its floors in a dark barn wood color. The railing frames, wood columns and ceiling are all painted in white, with matching white powder-coated metal furniture pieces. A stylish glass safety divider separates the pool area from the patio. A minimalist and spacious patio overlooks the pool with light cream porcelain tiles for its flooring and light cream paint for its walls. It has built-in kitchen cabinet counters with frosted glass cabinet doors and white solid-surface countertop material. 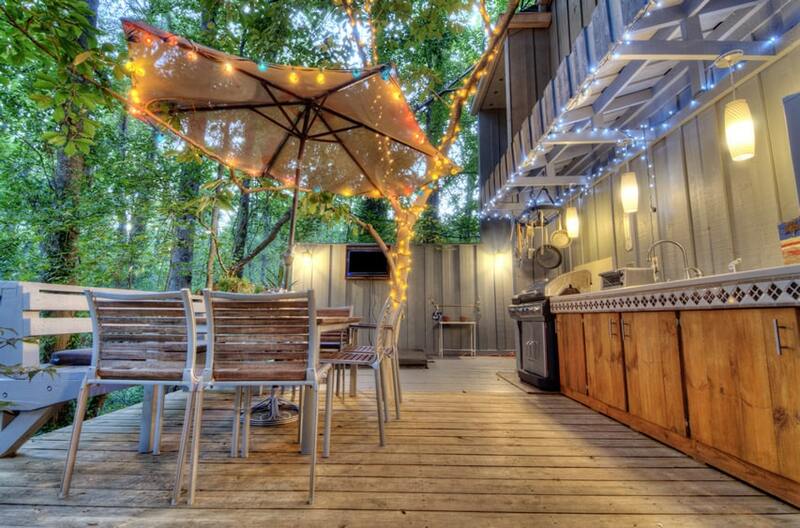 A large stainless barbecue grill, with outdoor kitchen area complete with sink is perfect for summer days. A modern picnic bench with white upholstered seating and polished wood table provide a space to enjoy a delicious meal outdoors. 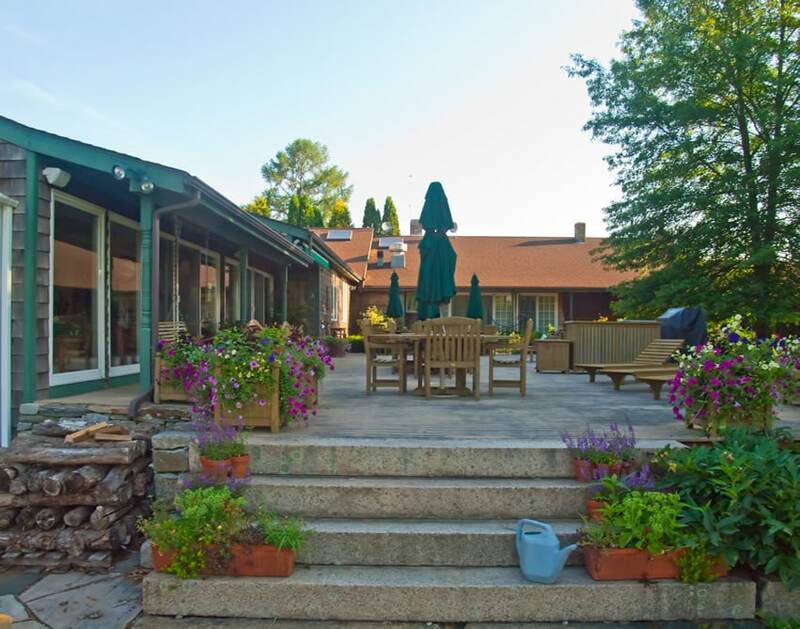 This sunny patio area provides a relaxing atmosphere and expansive views of the surrounding lake. A large open modern balcony with 30×30 white ceramic anti-slip tiles and plain painted walls in white and dark beige. Furniture used uses powder-coated metal with treated solid wood pieces. 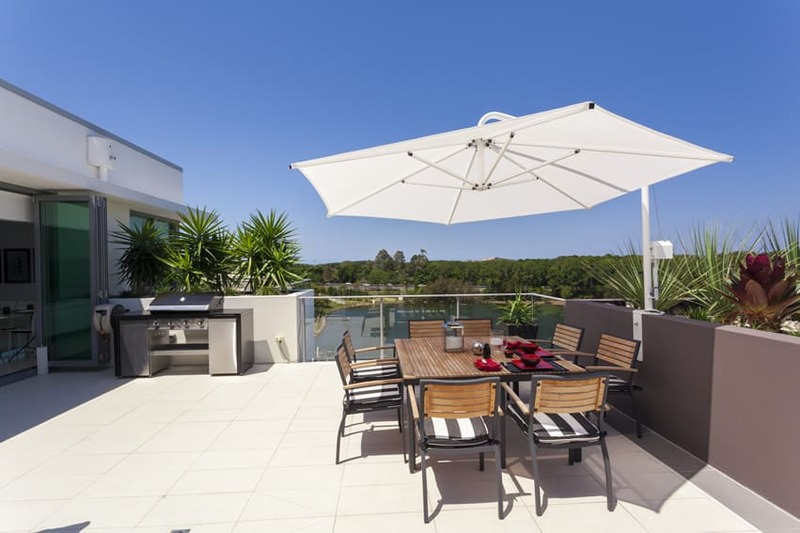 When coming up with patio design ideas its important to consider the environment your home is in to make sure you have plenty of shade or cover from both sunny & rainy weather conditions. A gorgeous garden patio with terrazzo flooring which uses small river pebbles. It also has solid wood trellis and terracotta red bricks, as well as gray-painted wood sidings for the exterior walls. 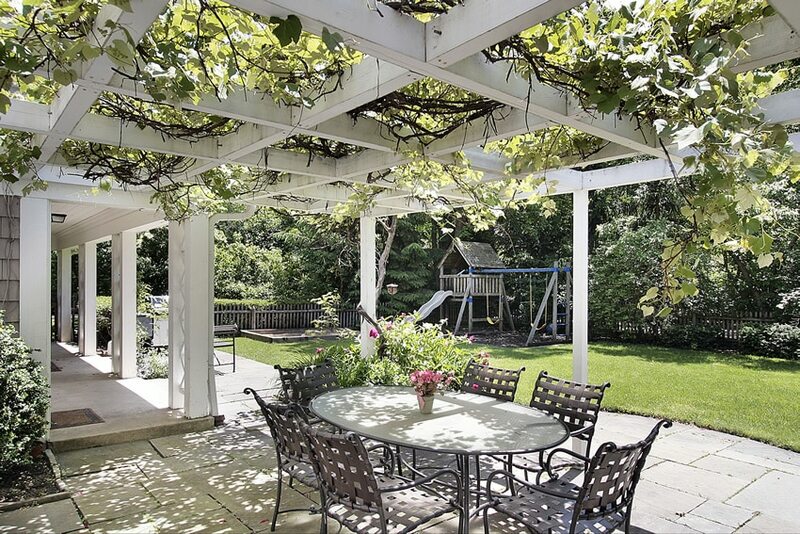 A garden pergola sits to the side and is covered with red trumpet vine flowers and add to the beauty of the space. A large modern patio with natural stone tiles in 30×60 cuts and a running bond pattern. The area is covered by fiberglass to protect the area from heat and rain. It also uses various wood tones and materials for its furniture pieces. Narrow wood deck railing looks elegant and is safer for small children than wide railing. Red pillows make an impression when positioned on the white upholstery of the outdoor couch and chair. An outdoor patio with a very natural feel, using loose stones and pebbles for its floors instead of fixed tiles or paving materials with a white-painted wooden roofing and complementing white wood furniture. A rustic looking wood canopy with climbing vines provides a romantic ambiance. 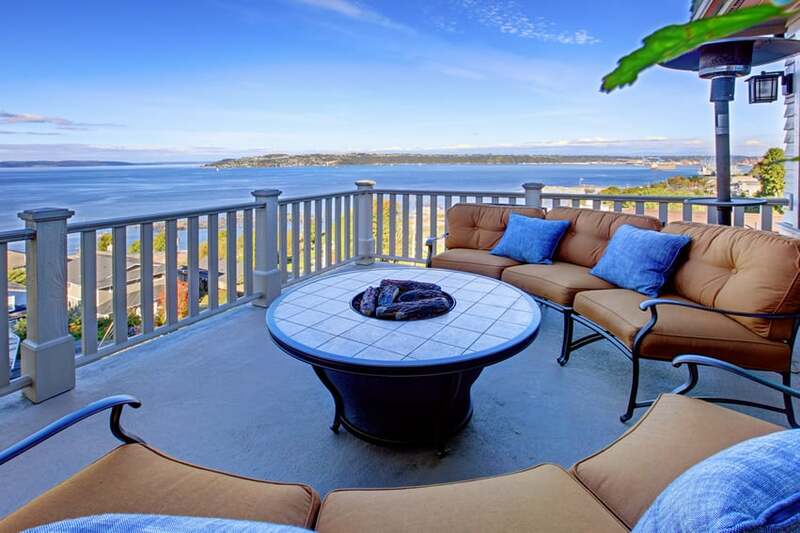 This patio has a beautiful ocean view in this open balcony patio area. The floors uses light cream terrazzo and its exterior walls uses wooden clapboard shingles treated to be resistant to moisture. The railings are made of wood and painted in a light cream color. Traditional style porch lights lite up the area at night. 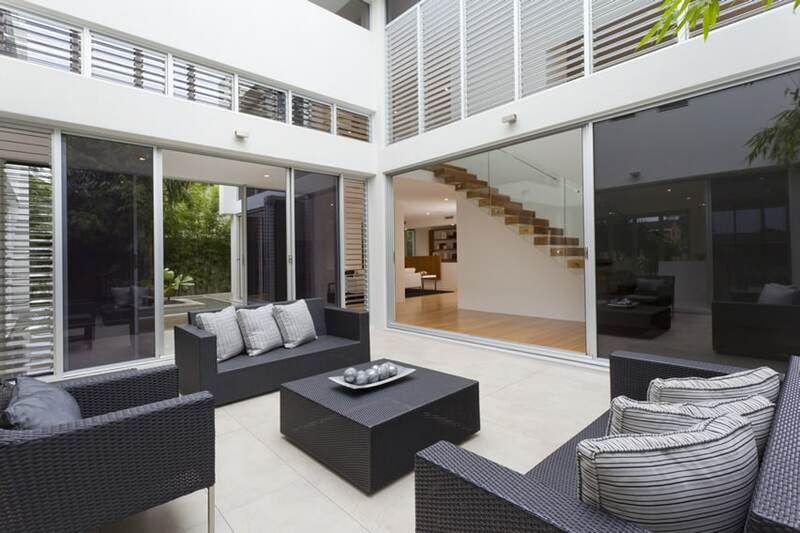 A modern patio area which looks good enough to be an indoor living area. The walls are plain white in color, with light gray ceramic floor tiles. Black-tinted sliding doors and white shutters separates the indoors to the patio area. 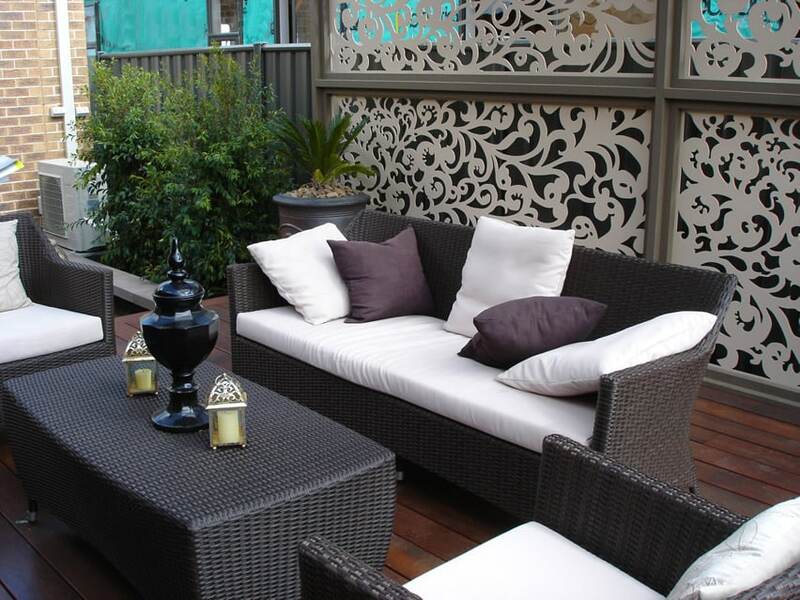 Synthetic black patio furniture in a modern design gives this area an attractive appearance. 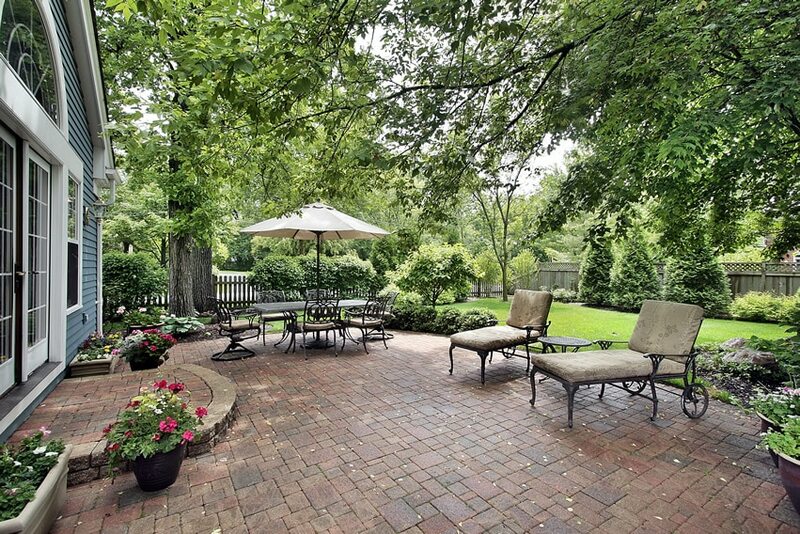 This open patio uses brick pavers in basket-weave pattern for its flooring material, combined with white-washed bricks in a running weave pattern for its fireplace area. The exterior walls of the house is also clad in the same material as the fireplace. 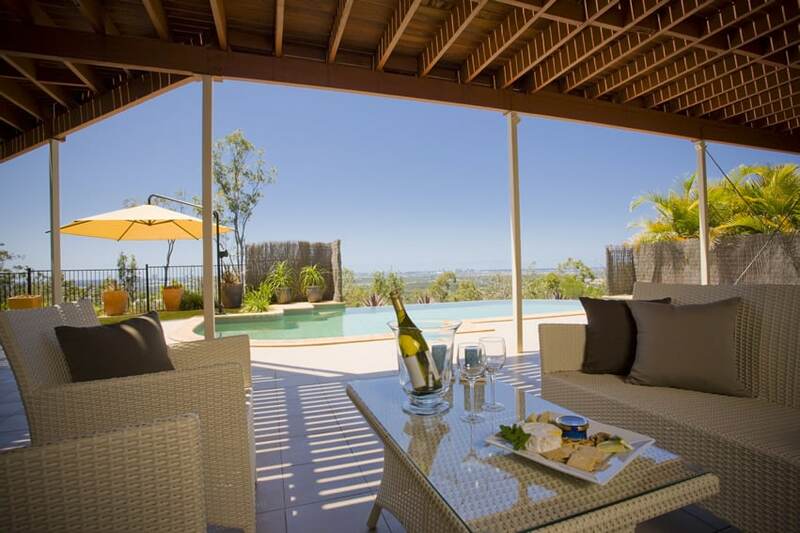 A swimming pool area provides plenty of opportunities for patio design ideas. This pool-lounge backyard has red ceramic tile floors with cement grouting and a gorgeous stretched fabric shade in a warm brown color. Furniture pieces uses outdoor-appropriate materials (synthetic rattan) while the pool-side uses limestone tiles and mosaic border tiles. A thatched cabana makes an excellent retreat space for lounging, and a large decorative fountain increases the aesthetics and the mood. 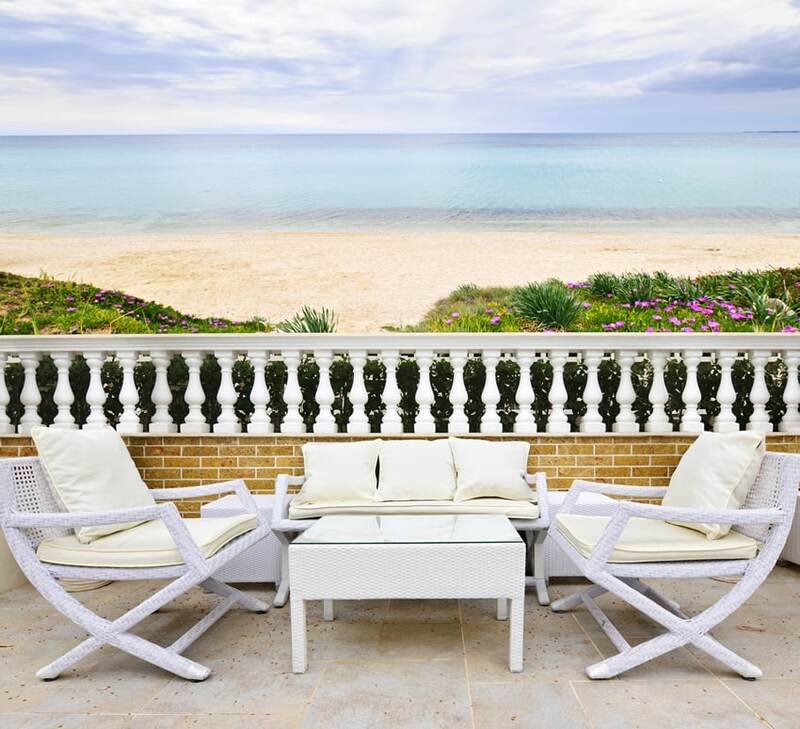 A patio with a lovely sea-side view, it uses natural stone tiles for its floors with anti-slip properties and uses limestone cut in the size of bricks to finish its railings with white-painted concrete balusters. 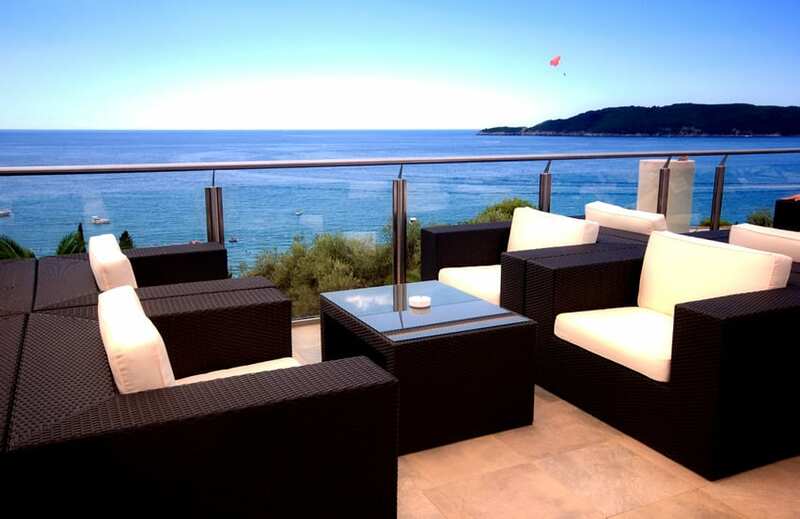 This patio provides a great view of the sea with its clear tempered glass railings and brushed stainless steel handle bars. Its floors uses natural ceramic tiles with anti-slip properties and outdoor furniture pieces which uses synthetic rattan and weather-proof upholstery. 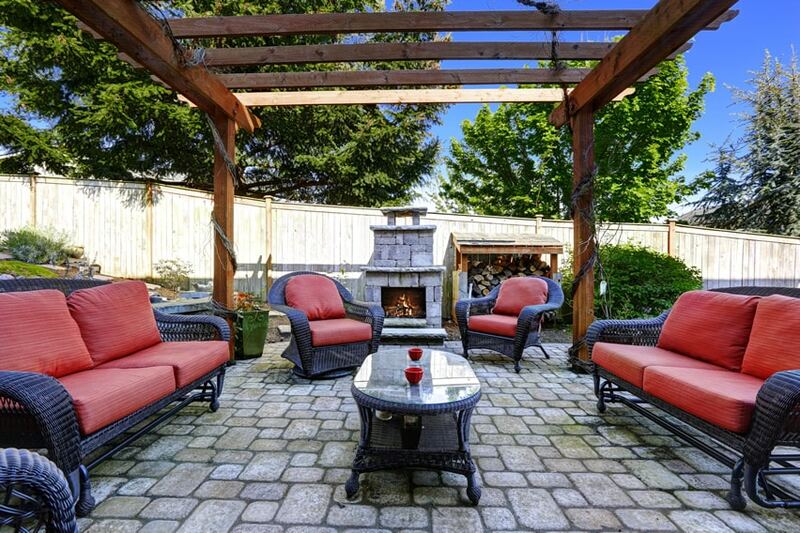 A quaint patio/barbecue area with square terrazzo floors with large gaps allowing natural growth of grass. 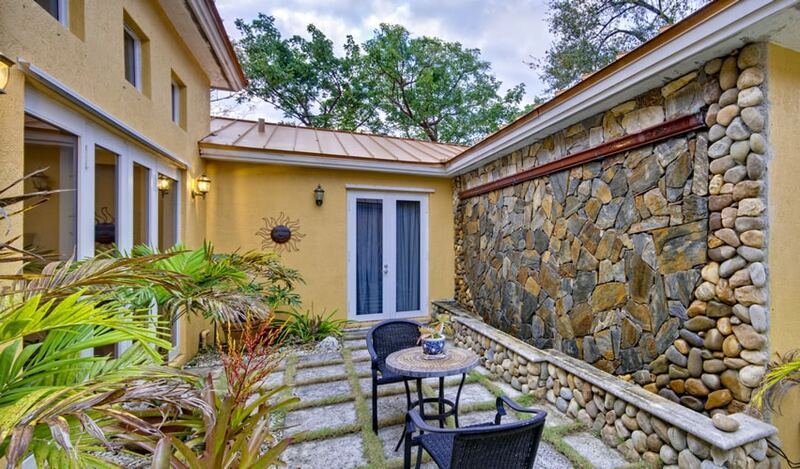 It also has an accent wall clad with natural river stones and natural cut stones. The walls maintains a rough finish and painted in a yellow color, giving it a modern Mediterranean feel. 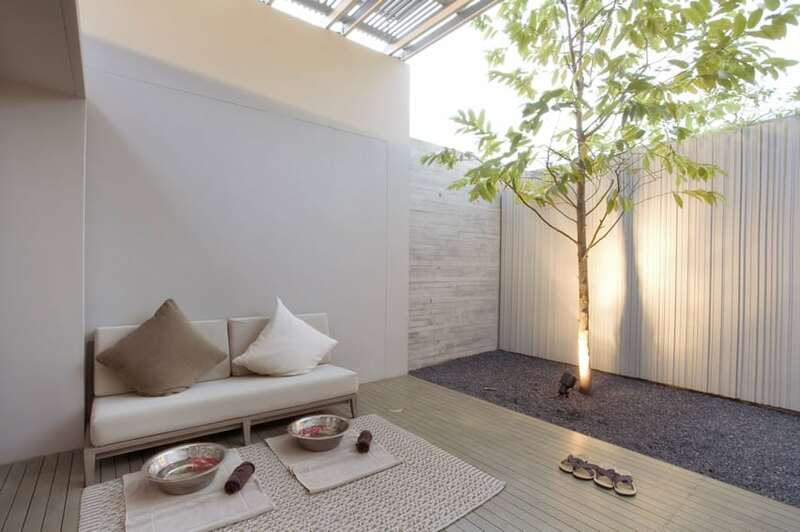 This is a modern garden patio surrounded by plant-life and hides you from the sun with its white-painted wood trellis. The floors uses a stained concrete-finish with anti-slip treatment in gray and light gray, arranged diagonally. This covered patio area which uses poured colored concrete floors in sandstone color. Walls are painted in a similar color to the floors, and the furniture pieces uses synthetic woven materials as substitute for rattan. 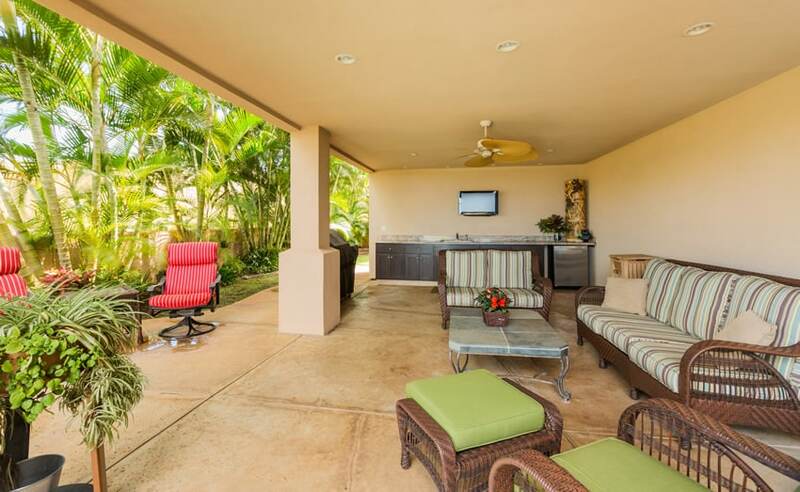 A tiki bar and outdoor kitchen area against the wall provides a mini-fridge, and an area to mix drinks and prepare food from the barbeque. This patio looks so cozy it almost looks like it’s an indoor living room. Floors are of solid Cherry wood and walls are clad with terracotta red subway bricks, complemented by a fireplace with masonry stone tiles and gorgeous outdoor living room set. Small potted plants add a little green and contrast nicely against the red and browns. For this open patio, weather-treated reclaimed wood was used as its decking floors. 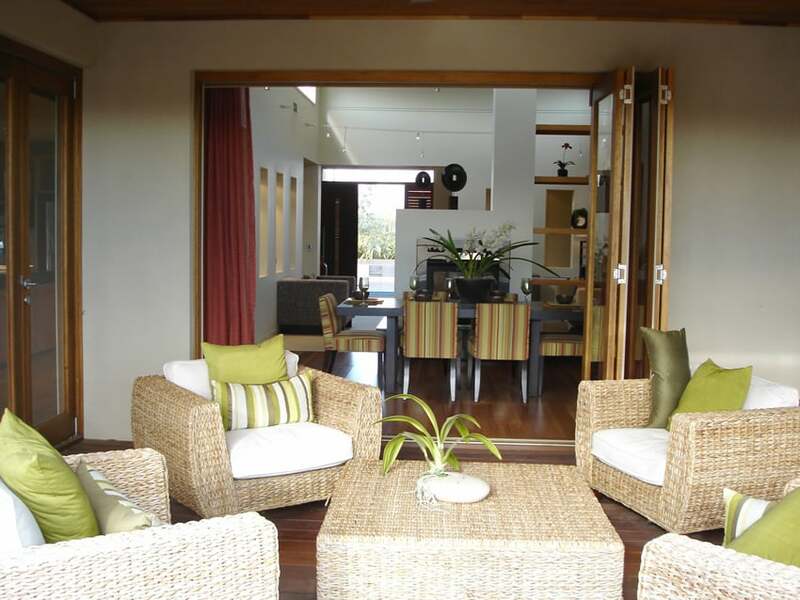 It also has furniture pieces which uses synthetic rattan so it can withstand even when it gets wet. 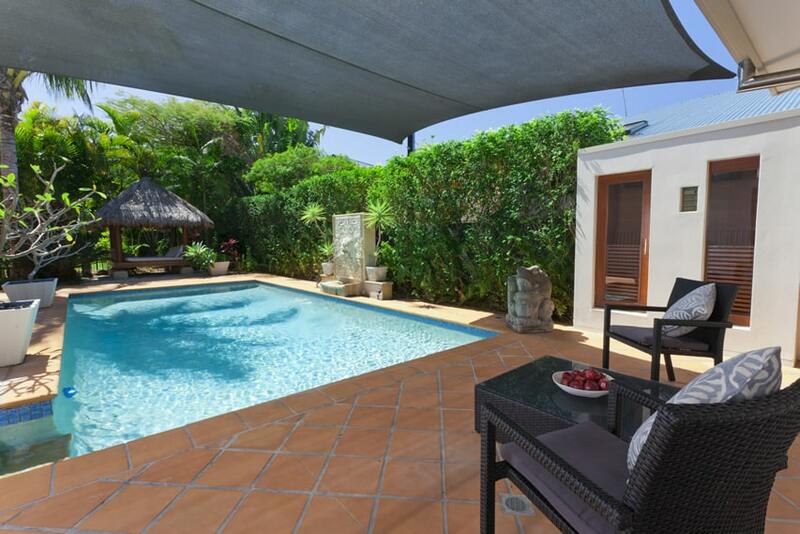 This lounge area by the pool surrounds itself with a gorgeous view of nature. The floors for the whole outdoor area uses large square cuts poured concrete stained red. 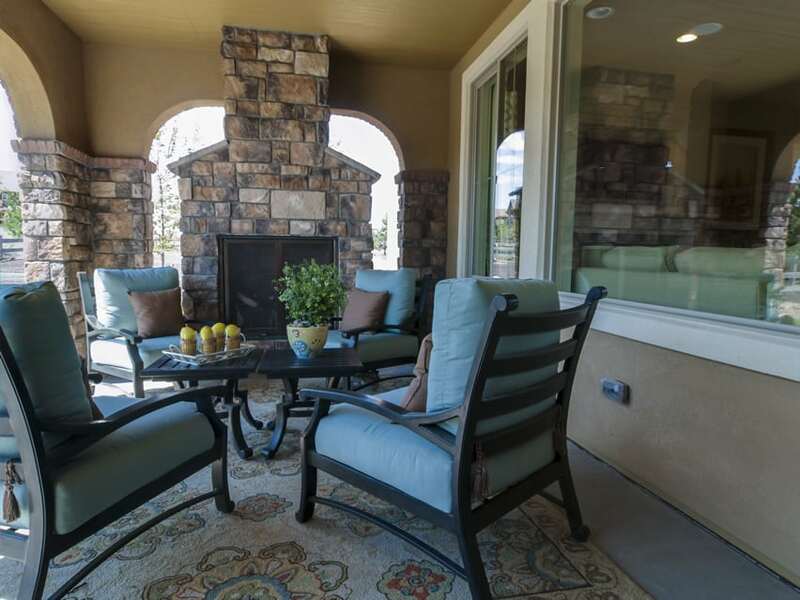 Lounge chairs make a perfect place to relax by the outdoor fireplace to take in the ambiance. 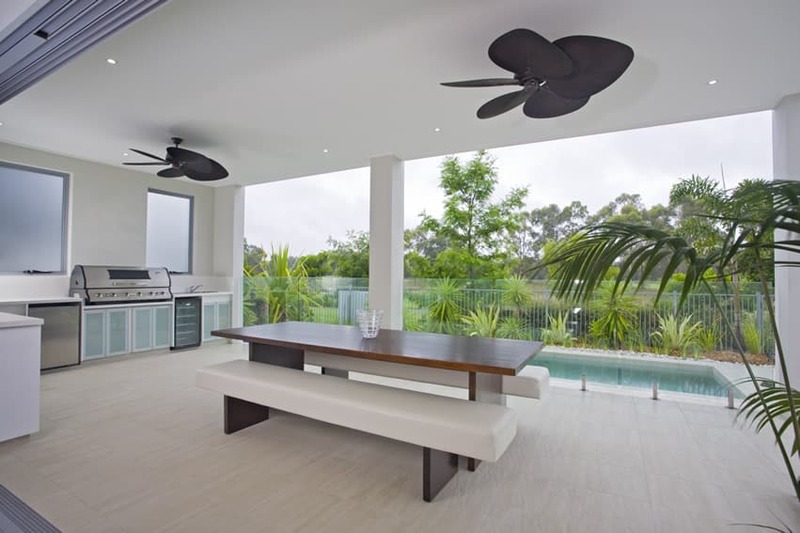 This modern garden patio offers a magnificent view of the landscaping and pool area. It has large white ceramic tiles for its floors and warm gray paint for the walls and the columns. The patio ceiling has planks of Golden Oak wood complemented by wood supports in the same color for the columns. 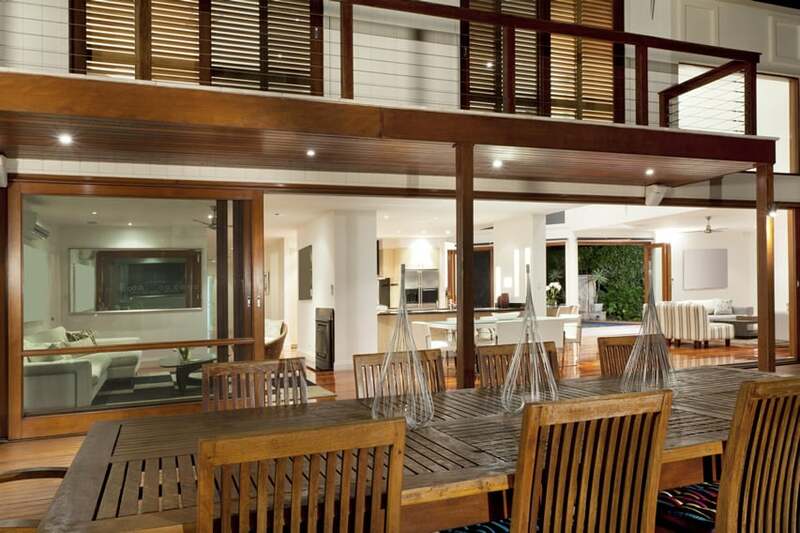 A large outdoor dining table provides plenty of space for enjoying a meal and entertaining. 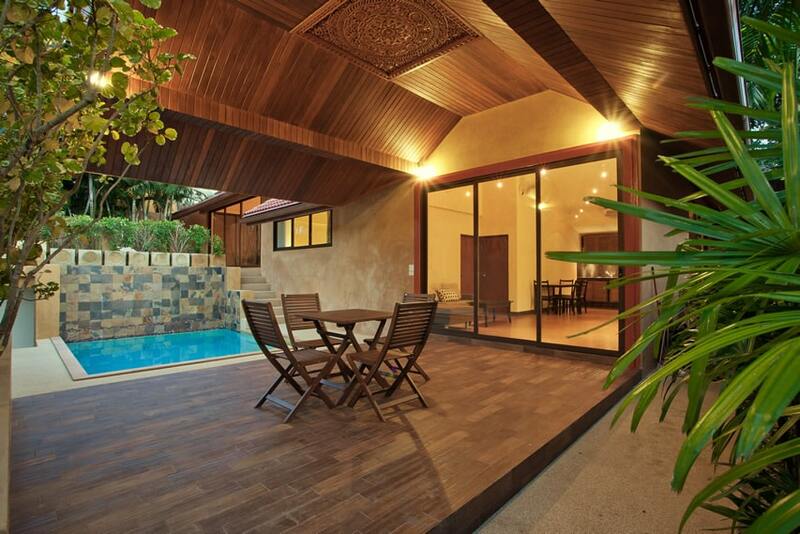 A gorgeous Asian-inspired patio with lovely solid wood floors in dark mahogany finish and ceiling clad with planks of engineered wood in a Teak finish. This is topped with a pierced wood screen in a similar teak wood finish with an intricate design. This modern pool-side patio design which uses light gray non-slip ceramic tiles as its main flooring material which extends until the pool-side area. 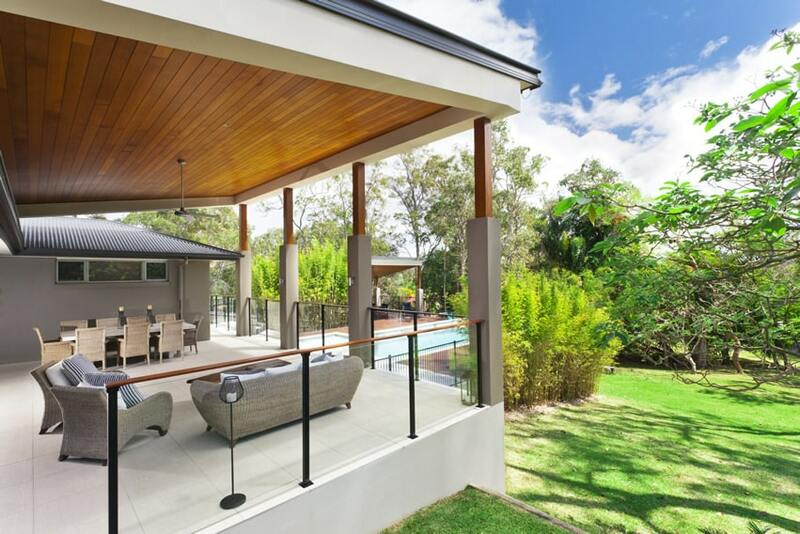 The tempered glass railings provides an unobstructed view to the pool, and the retractable awning makes a quick patio roof that helps keep the area dry from the rain and away from the heat of the sun as needed. This garden patio area has a nice rustic appeal with its use of weathered and bleached wood plank floors. The walls are only painted in white, but the wooden shutters and complementing trellis with fabric shade gives it a feel similar to Asian-themed resorts. 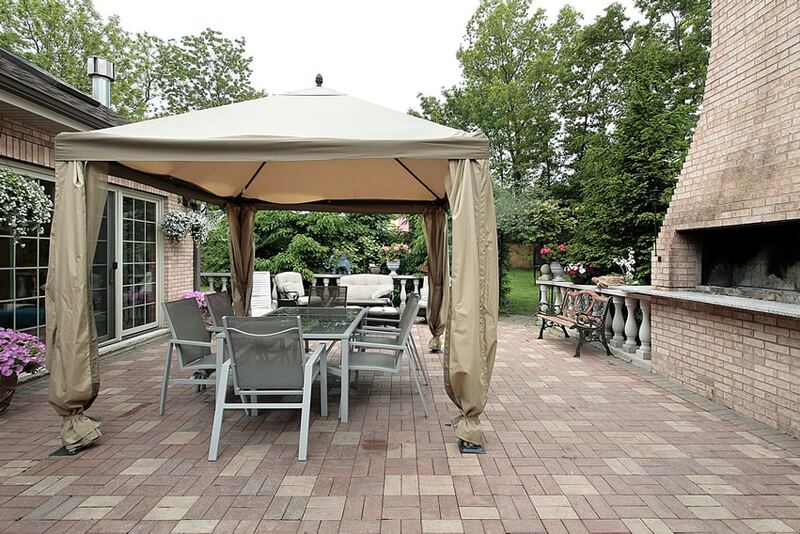 The patio roof is a wood pergola with fabric sunshade material. This pool-side covered patio uses PVC decking for its floors in a dark Mahogany finish, while its ceiling uses engineered tongue and groove planks in Brazilian Walnut finish. The pool area is bordered by natural stone tiles in a light gray color, while the rest continues to use PVC decking. A covered patio with fireplace which uses large, square-cut natural stone tiles in a gray color. 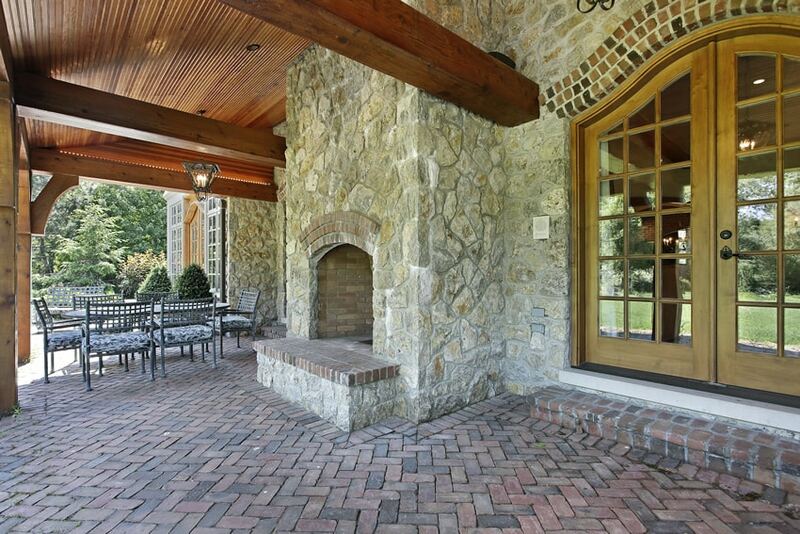 The outdoor fireplace and the columns are clad with natural-cut stones in a beige/cream color. 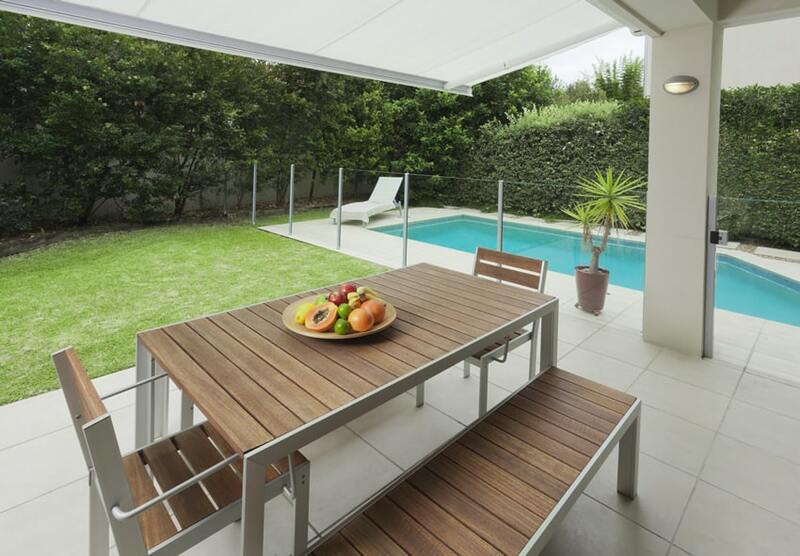 Modern outdoor furniture in orange and brown compliment the patio roof which features a large wood canopy overhead. 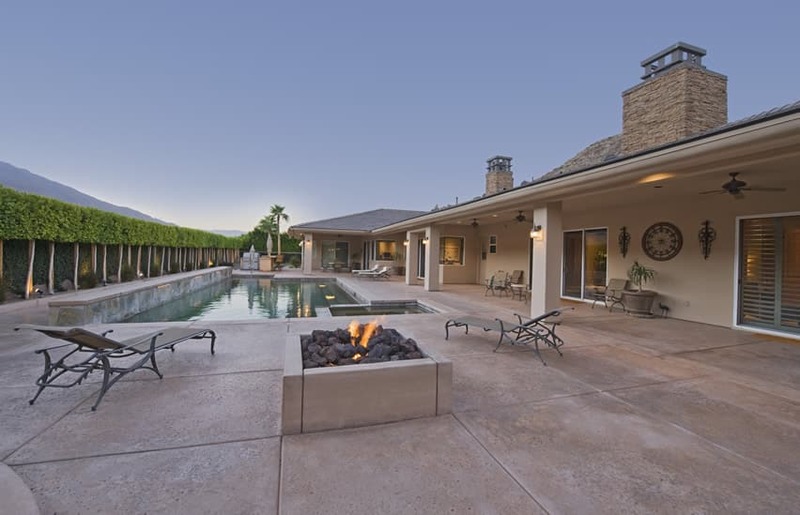 This covered patio features a fireplace with mantel and plenty of room to sit and relax next to the swimming pool. A ceiling fan helps keep things cool during the hot summer months. 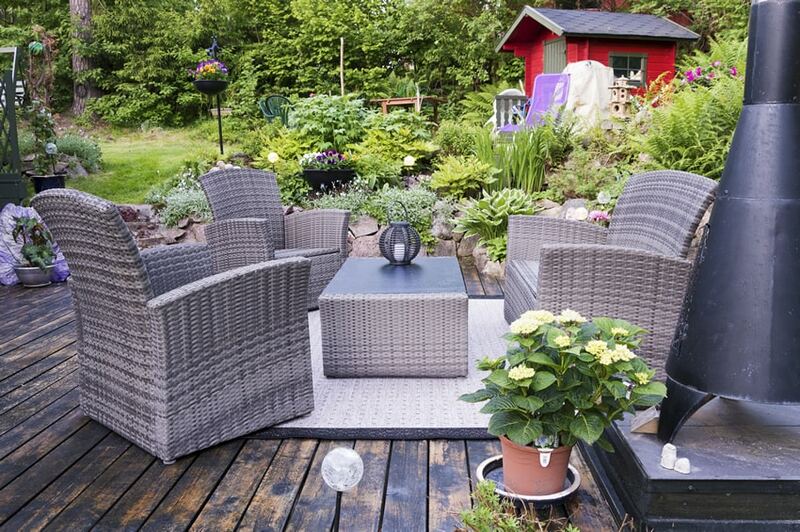 The synthetic wicker furniture with cushions is ideal for durable furnishings that can better handle sunlight and the outside elements. This beautiful semi-outdoor patio area uses large sandstone porcelain tiles for its floors with a matching light beige color for the walls. The furniture used uses rattan and bleached wood. Recessed lighting offers plenty of illumination and can be controlled to adjust the brightness. Decorative pillars add to the aesthetics of the space. A classic covered garden patio design which uses Spanish style terra cotta red paving tiles with concrete grouting. It has a nice view of the garden and the pool area, with white painted walls and white-painted ceiling with exposed wood planks. Climbing vines enhance the greenery of the area and bring the garden feel in. This patio uses light red stamped concrete for its floors with a multi-colored masonry tiles for its walls. The floors are divided into squares with a border of concrete with pebbles. 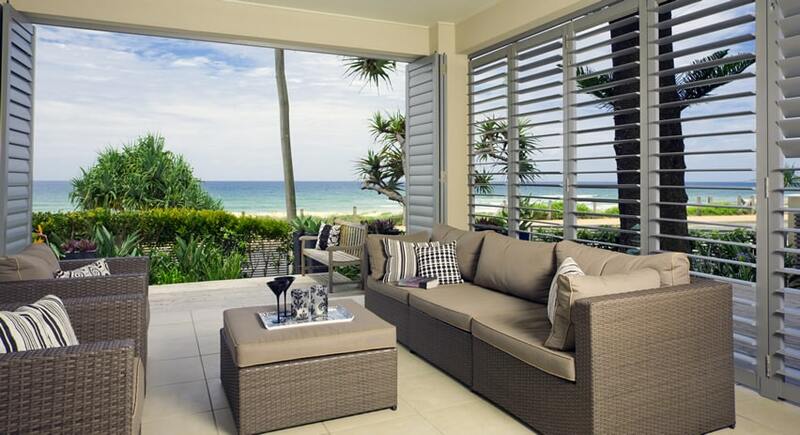 White outdoor wood furniture with light brown upholstery and pillows are used for both decor and comfort. This covered patio area uses ceramic stone tile floors with various tile cuts and sizes, combined with plain white walls and ceiling. The fireplace area is highlighted with its surrounding Moroccan hand-painted tiles and topped by a wooden ledge which runs across the whole wall. The patio looks out over the stone pool and spa, along with the impressive mountain range in the backdrop. 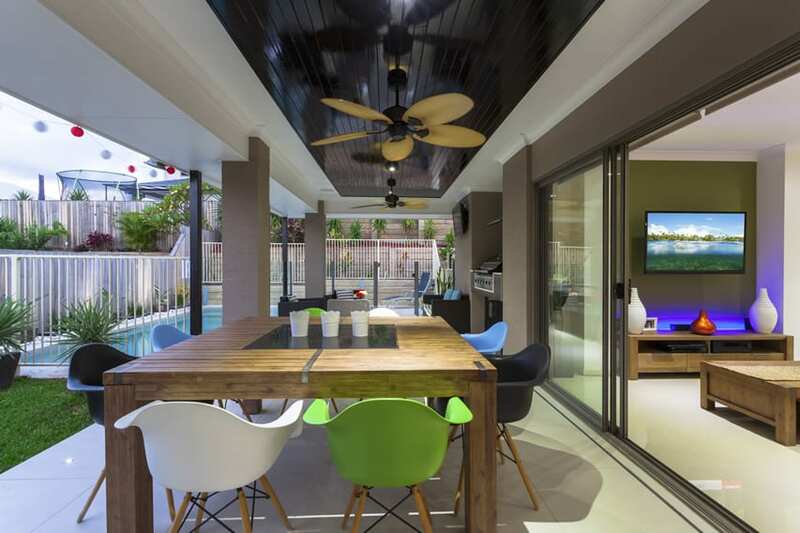 This modern patio is a convertible space, making use of sliding doors with horizontal shutters to enable its users to easily convert it into an indoor or outdoor space. Floors have light beige ceramic tiles and walls are painted in a light cream color. 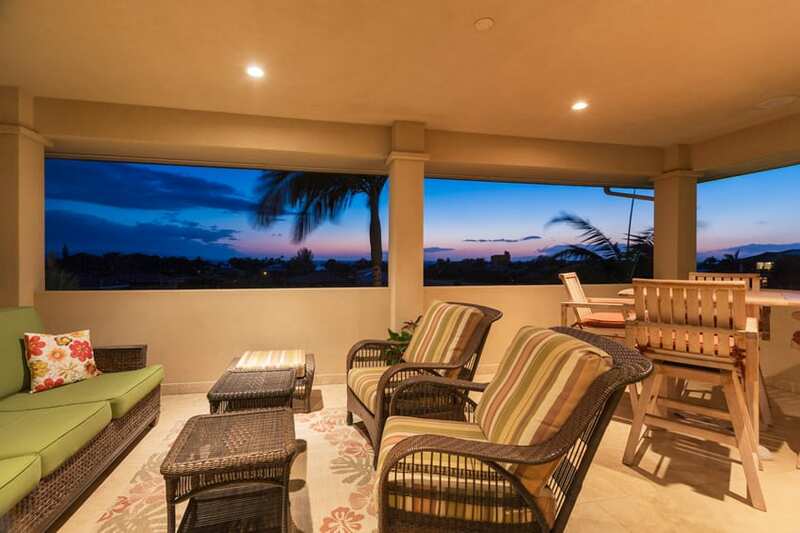 The covered patio opens up to the ocean front deck which offers further opportunity for relaxing and taking in the views. 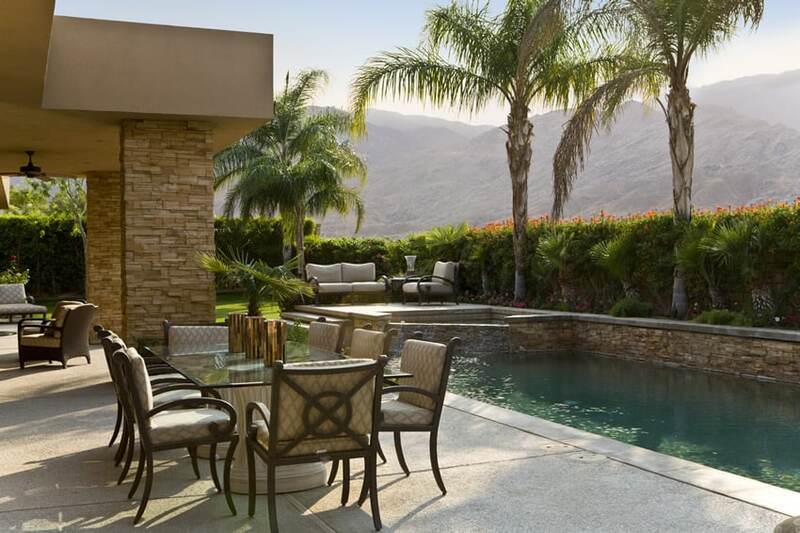 A gorgeous pool-side patio which uses white ceramic tile flooring. 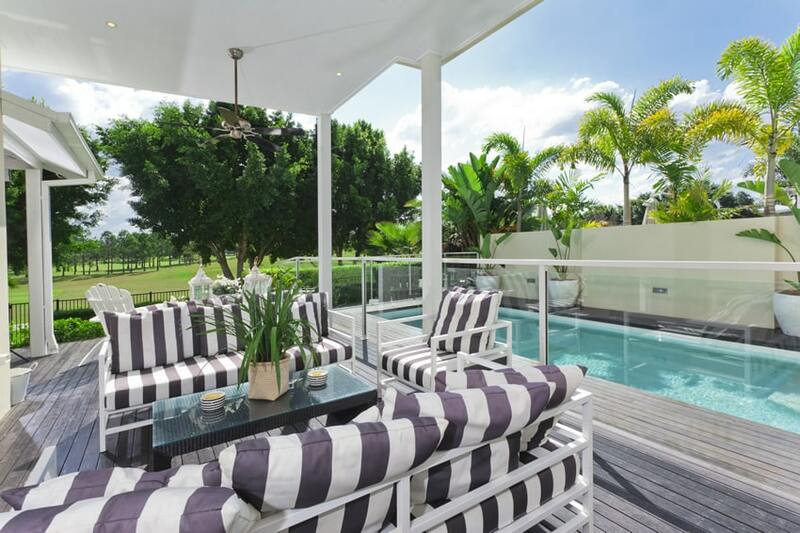 The area is shaded by white-painted wooden planks and columns, with a complementing set of white synthetic rattan furniture with gray throw pillows.